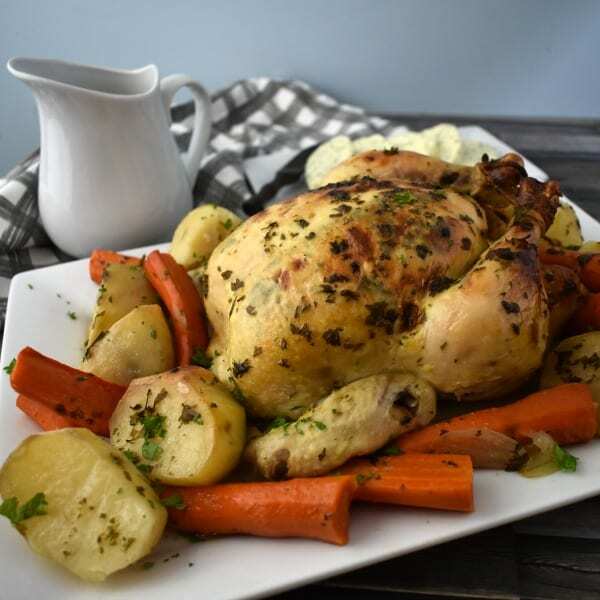 Roasted Chicken and Vegetables doesn’t get more delicious than this recipe that features our famous Cowboy Butter! This one pan meal is simple but oh-so-very delicious. Be sure to pin this one because you’ll be making it again and again. 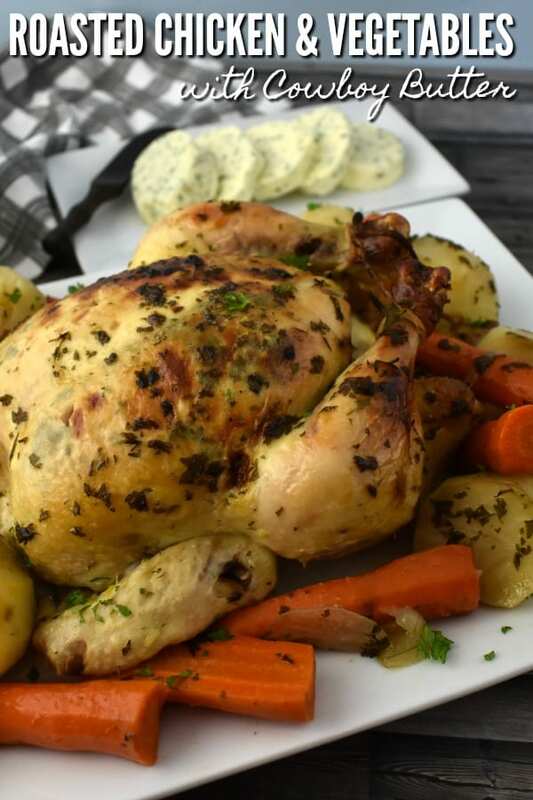 Using Cowboy Butter to season the chicken before roasting will add so much amazing flavor! This compound butter made with fresh parsley, garlic and other seasonings with a bold taste that is amazing on just about everything. Plus, smearing the butter under the skin will help the meat stay moist and the skin become crispy. 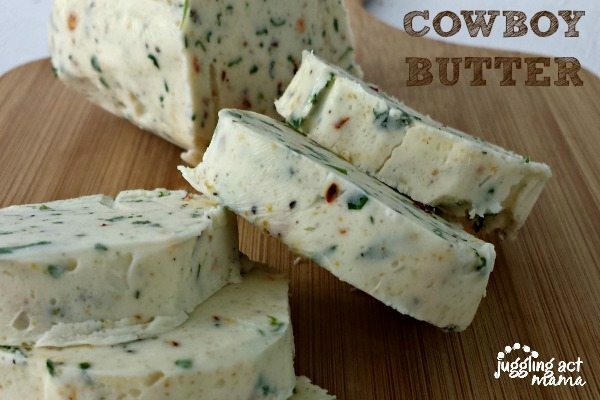 Cowboy Butter is hands down one of our most popular recipes here on Juggling Act Mama, and this is the perfect excuse to make it. Truss the legs using butcher’s twine (tie the legs together). Cook for 20 minutes per pound at 350-degrees F.
Pro Tip: Look for root vegetables that are very firm – the harder, the better! Add the onion to the bottom of the roasting pan. Rinse the chicken, discard the gibbets, and truss the legs. Set the chicken on top of a rack in the roasting pan. Place the whole cloves of garlic and half the lemon inside the cavity of the chicken. Massage 2 tablespoons of the softened cowboy butter all over the chicken, including under the skin. 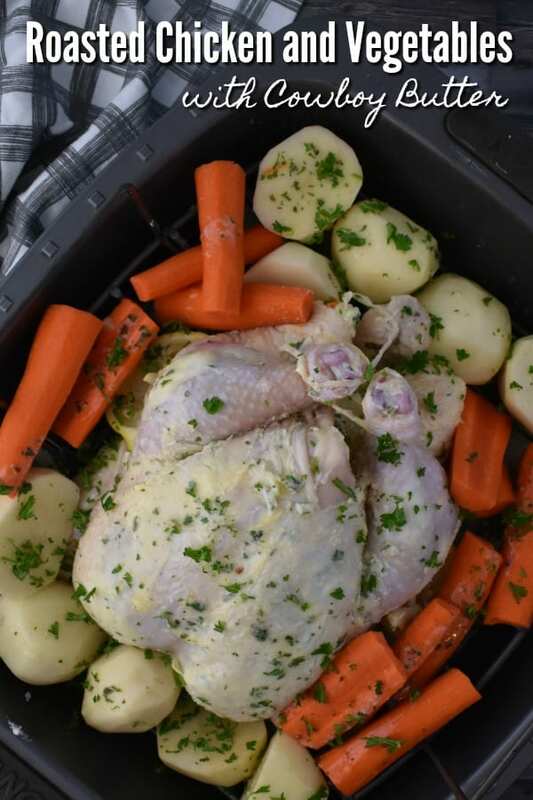 Arrange the potatoes and carrots around the chicken on the roasting pan. Melt an additional 2 tablespoon of cowboy butter and drizzle over the vegetables. Cook at 350 degrees F for 20 minutes per pound, or until the internal temperature reaches 180 degrees F (there will be some carry over cooking after you remove it from the oven). Remove from the oven and cover with foil. Let set for 10 minutes. Strain the drippings into a large liquid measuring cup. In a small saucepan, melt 2 tablespoons of butter. Whisk in 2 tablespoons of flour and cook 1-2 minutes. Slowly add the liquid to the saucepan and whisk to combine. Cook over medium-high heat until the liquid reduces and thickens. Serve immediately. Looks pretty amazing, right? The chicken is succulent and the skin is crisp. Plus you have your perfectly cooked potatoes and carrots all in the same pan. Making gravy from the drippings is a cinch and takes just a few extra minutes. Because we test all our recipes, we recommend that you make them once just as it is without substitutions or changes. Sometimes variations can go awry. 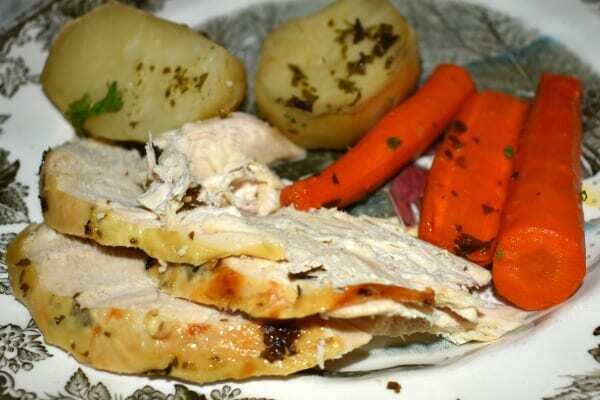 Making our Roasted Chicken and Vegetables recipe as we have tested it will yield the best results. If you really want to get creative, here are some ideas for variations that might work well. (Please note, we have not tested these variations). You can also serve this tasty meal a Thanksgiving staple and uber popular Make Ahead Mashed Sweet Potatoes with Brown Sugar. Round out the meal with these simple dinner rolls and you’ve got a meal fit for a king! Mom’s Best Beef Pot Roast Dinner from A Spicy Perspective also makes a great Sunday Supper. For another homey meal, try this Chicken Fried Steak with Gravy from Mom on Timeout. Our individual Turkey Pot Pies are delicious take on the classic Chicken Pot Pie. Oh my! This reminds me of Sunday dinners at Grandma’s! Thanks for stopping by, Helen! It is such a classic dinner, but with the Cowboy Butter, it’s got a little makeover!